Global diabetic footwear market is gradually growing owing to the safety and vital comfort features of the diabetic footwear which keeps the person less prone to foot related diseases. As per the statistics people with diabetes are 10 times prone to foot amputations compared to people without diabetes. With the increase in per capita income of Asia-Pacific region countries such as Japan, Australia, Singapore, the spending capacity has increased and thus demand for diabetic footwear is also increasing. Goldstein Research analyst forecast the diabetic footwear market size is set to reach USD 8.43 million by 2024 from the current USD 4.3 million, growing at a CAGR of 7.01% over the forecast years. The increasing number of diabetic patients, rising old age population, diabetic footwear availability awareness among diabetic patients and the high cost of diabetes treatment are the factors that will impact the growth of diabetic footwear market. 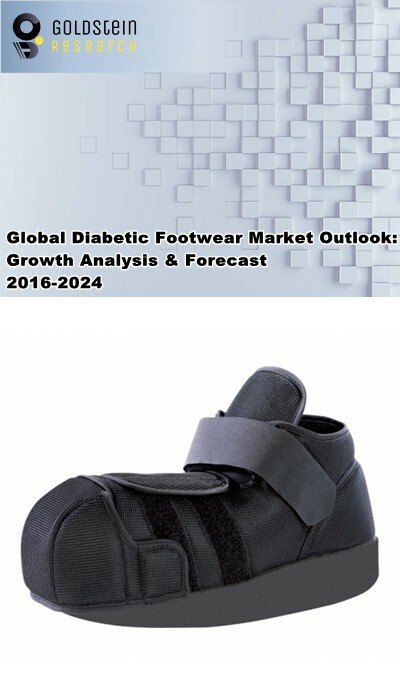 The report covers the present ground scenario and the future growth prospects of the diabetic footwear market for 2016-2024 along with the statistics of the total shipment of diabetic footwear. We calculated the market size and revenue share on the basis of revenue generated from major players and sales of diabetic footwear on the basis of number of diabetic patient present worldwide. On the basis of product, men diabetic footwear products are the dominant end user in the diabetic footwear market over the women diabetic footwear products with the market share of 57:43 respectively, as males are more prone to diabetes because it requires lesser increase in weight to develop the disease. At the rate of 5.6% CAGR, females are expected to be the fastest growing end user due to the upcoming trendy and fashionable diabetic footwear. Diabetic footwear market outlook 2016-2024, has been prepared based on an in-depth market analysis from industry experts. The report covers the competitive landscape and current position of major players in the diabetic footwear market. The report also includes porter’s five force model, SWOT analysis, company profiling, business strategies of market players and their business models. Global diabetic footwear market report also recognizes value chain analysis to understand the cost differentiation to provide competitive advantage to the existing and new entry players. According to the report, major driving factor for global diabetic footwear market number of diabetic patients over 18 years of age has risen from 4.7% in 1980 to 8.5% in 2014, especially among the old age population. The awareness towards the benefits of diabetic footwear and the rising expense on the diabetes treatment is compelling the patients to raise the demand for diabetic footwear. Further, high cost is one of the major challenges for the industry players which are restraining the growth of sales. In developing nations there is less awareness about the diabetic footwear moreover their spending ability is low as compared to other developed nations are the major constraints against the demand of diabetic footwear. Based on geography, Asia-Pacific has 36.8% market share in 2016 of the global diabetic footwear market. Rise in aging population in major economies such as in China, Japan and others with their increasing disposable income have the high demand in Asia-Pacific region. On the other hand, North America also holds the largest market share of 29.7% in 2016 in global diabetic footwear market owing to huge population of diabetic patients and the awareness among the diabetic population towards the benefits of diabetic footwear. Global diabetic footwear market report comprises of the following companies as the key players in the diabetic footwear market: Aetrex Industries, Inc., New Balance Atheltics, Inc., Orthofeet, Inc., DJO Global, Inc., Drew Shoe Corporation, Propet USA, Inc., Hush Puppies Retail, Inc., Skechers U.S.A., Inc.
Other high-flying vendors in the diabetic footwear market are: Finn comfort, I-Runner, Pilgrim Shoes, Dr. Comfort, Dr. Zen Products, Inc., Podartis Srl. What is the revenue of diabetic footwear market in 2015-16 and what would be the expected demand over the forecasted period? 7.2.2. New Balance Atheltics Inc.
7.2.7. Hush Puppies Retail Inc.
7.2.13. Dr. Zen Products Inc.